Texas board of education hearings: Moses and states’ rights in social studies textbooks. Turns out it’s actually pretty common for people to mistake Texas as the next target for incorporation into ISIS’s caliphate. Texas’ standardized curriculum was discarded last year in part because of accusations that it was pro-Islam and because in one school, during one lesson on Islam, a few students wore burqas. The incoming Texas lieutenant governor, Dan Patrick, ran a television ad about how ISIS was infiltrating Texas’ borders. But as Jose Maria Herrera, a professor at the University of Texas at El Paso, pointed out, the war was “an event in which it is difficult to paint the United States in a positive light.” He was disappointed by the “scant treatment” of the Mexican-American War in Pearson’s and other textbooks. Rather than seeing subliminal messages, Herrera said the books engaged in a “deliberate attempt to avoid confronting a problematic era in American history.” Still, discussing the Mexican-American War at all is an improvement. In April, when the state board was considering a course on Mexican-American history, board member David Bradley, according to the Associated Press, “called the course ‘reverse racism’ and threatened ‘to pull a Cesar Chavez and boycott.’ ” Bradley then boycotted public testimony about the course. Climate change was another issue that conservatives were worked up about. McGraw-Hill’s World Geography and Cultures textbook originally gave credence to both the Intergovernmental Panel on Climate Change, a Nobel Prize­­–winning science organization, and the Heartland Institute, a science-denying think tank. The book stated erroneously that many climate scientists disagree with the fact that greenhouse gases are causing our climate to change. After public outcry, McGraw-Hill, Pearson, and other publishers that had made similar errors about climate change corrected them. That upset conservatives. MerryLynn Gerstenschlager, vice president of the right-wing Texas Eagle Forum, testified that climate change was a United Nations plot “about the redistribution of wealth.” Board member Pat Hardy wanted both sides of the “global climate thing” to be taught. Caleb McDaniel, a Civil War historian at Rice University, told me that “It’s misleading to say slavery was just one of several causes of the Civil War because every other causal factor was tied to slavery.” Pearson kept its section on states’ rights the same. Free market economics was another point of contention. One testifier, Barbara Wilson, complained that Pearson attributed the cause of the Great Depression to income inequality rather than the Federal Reserve System’s monetary policy, so Chairwoman Barbara Cargill suggested that the Pearson representative in the audience meet with Wilson and change its textbooks. All of the textbooks from publisher Worldview were removed from the list of approved books by board members, partly in response to unsubstantiated claims that the books showed “bias against the United States.” One speaker accused Worldview of subversiveness for “slandering Douglas MacArthur by calling him a racist,” “omitting President Ronald Reagan’s accomplishments,” and “glorifying all people and things communist.” None of these claims were true, but Worldview’s books were still removed. Texas history standards call for teaching about the influence of Moses and biblical law on America’s founding documents. Textbooks followed these standards. Perfection Learning’s Basic Principles of American Government said Moses contributed the idea that “a nation needs a written code of behavior” to the American government. It also recommends the Book of Exodus to students for further reading, an endorsement of religion. 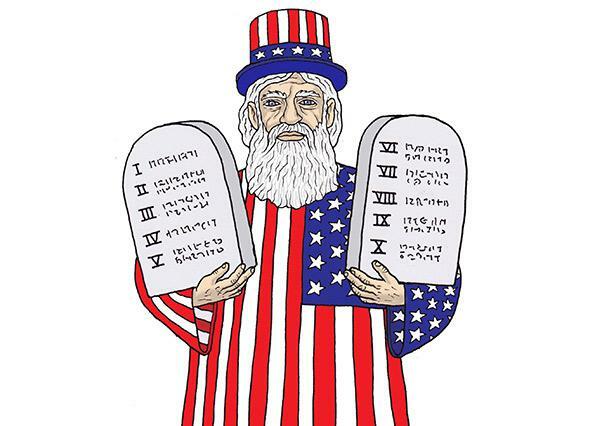 Other publishers, including Pearson and McGraw-Hill, in their attempts to meet Texas’ standards had sections on Moses’ contributions to the American Constitution. I testified about the major violations of separation of church and state in these textbooks, but all of these endorsements of religion remain in books that have been adopted for teaching history in Texas public schools. Sections on Harvey Milk (which originally erroneously called him the first openly gay elected official), Sikhism, and Hinduism were corrected. (Books no longer say that Sikhism is a subset of Hinduism or that all Hindus are vegetarians.) But on the whole, the revisions to Texas textbooks have been a mixed bag, especially because some of our history textbooks contain material that isn’t history. These problems aren’t just Texas’ problems. Because Texas is such a large purchaser of textbooks, publishers shape their books to meet Texas’ standards and sell them all around the country. School districts in New York or California can teach their kids all about Moses now, too.